Reading about people going through pain is one of the less pleasant parts of the literature experience. Seeing a person’s trials and tribulations can be very disturbing as the good writer will describe the actions that happen and leave you cringing as you imagine what they are going through. This applies wherever they live on this planet. When one reads Susan Abulhawa’s Mornings in Jenin or Kagiso Molope’s Dancing in the Dust for instance, one feels much pain. Mornings in Jenin is a story about the Palestinian dilemma from a Palestinian view while Dancing in the dust talks about a young woman’s tribulations in South Africa during the crisis in the 1980s that led to the freedom of that country. The pain you read in these books will leave you in tears if you don’t watch out. If the pain of people in other lands can affect a person try and imagine how much pain can be wrought upon an individual if a book talks about issues that are close to their heart. 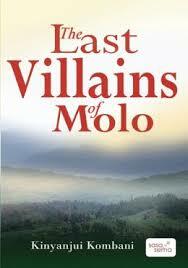 This was the feeling that I had to go through when I read Kinyanjui Kombani’s The Last Villains of Molo. The book starts at a frenetic pace as a young woman is hiding under a bed in Molo in 1992 and some intruders get into her home and kill her father leaving her alive and vengeful. The story then goes to Nairobi in 2001 where we meet some guys who are having a ball as they goof around in a discotheque in Nairobi town. We are introduced to Bone, Ngeta, Bafu and Rock and their lives in “The Slaughterhouse” a shack in the Ngando Slums in Nairobi. This happens as they meet the new girlfriend of the leader of the group Bone by the name Nancy. As we are reading this tale we are given a parallel narrative about the happenings in Kenya’s worst clashes leading to the 1992 elections in Molo. We are told of people of different communities and how they start killing each other. We see all sides of the struggle and start to see some sort of weird logic to the madness that happened two decades years ago. The Kalenjin see the Kikuyu as invaders while the Kikuyu are seeing themselves as the victims of attacks as other communities are forced to pick one side or the other. The battles are told in graphic detail which I don’t see a lot in Kenyan literature. It’s not pretty. The storyteller, who is very good, then starts connecting the past to the present as we understand who these guys in the slum are and their origin in Molo. The book took me quite a while to finish as it has some very painful tales retold. The worst part of them is that they involve names that I am familiar with like Lihanda, Kimani and Kipyegon. This is the tale of Kenya that we hear about in hushed conversations but never get to understand. Even more familiar and a welcome relief from the brutality is the new urban music that Bone experiences that we saw start from nothing that is currently a serious part of our entertainment sector. If you want to know about the “clashes” of Rift Valley that wracked Kenya, this is an invaluable read as it is a no holds barred tale including all the sides with an unnamed other force that remains in the background wrecking havoc. It takes a while but eventually the tale unravels as we learn of a conspiracy to finish off the slaughterhouse gang which will leave you shocked beyond. Even with the amazing content on offer the book has its flaws. The editing is seriously lacking especially considering that this book has won numerous awards as well as being printed over and over since coming out in 2008. There is also whole section of the book missing from pages 120 to 137 which are very important in the plot as one can tell this is where the name “Bone” for the main protagonist was born. It is also the bridge from the escape from Molo and their end at the Ngando slums. Even with these shortcomings the book is vital reading in the experience of the underbelly of Kenya’s history that we refuse to acknowledge as we surf on our high speed cellphones or free Wi-Fi in the matatu. Buy it if you get it. Assuming the next print run is cleaner than the one I read.